The myth of Diana and Actaeon is kind of a disturbing myth. Just why do people have to suffer for no fault of theirs? Mythology is replete with examples where characters undergo trials and tribulations for no fault of theirs, but this one still seems to be different. Diana (also known as Artemis sometimes) was the virgin goddess of hunting and wildlife. From an early age she had decided to remain a virgin and thus as a goddess she remained unattached and was also at times worshiped as the goddess who protected girls who had not attained puberty. Actaeon was the son of King Cadmus and was at the peak of his youth. He was brave and strong and was fond of hunting. Once he led a hunting expedition to the forests with his friends and hunting dogs. After a tiring day, all of them decided to take some rest. Actaeon, moved away from the group in search of water. Unknown to him, there was a secret place of Diana, who would come to rest and pamper herself in a spring. On that fateful day, Diana had just dipped herself in the pool and begun to let her attendants take away her clothes. Her bow and arrow and javelin were parked far away and Diana had just begun to relax her tired body, when Actaeon, unknown to the forest landed at the exact spot. Not used to men, her attendant’s shrieked and all tried to cover the bare body of Diana, by using themselves as shields. But Diana was tall and beautiful and the attendants could not cover her enough. 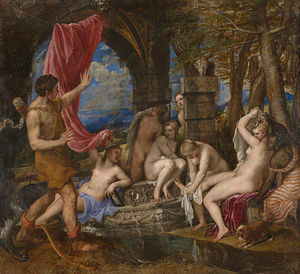 Actaeon had never seen such divine beauty and even before decency could enable him to shift his gaze, Diana threw some of the waters from the spring at him and said that he would never be able to tell any mortal what he saw. What she uttered was a curse, and no sooner had she completed her statement, Actaeon found himself running from there. While running, Actaeon suddenly grew antlers and from two legs he had gone on four. When he reached a spring, he saw his reflection and shouted in disbelief, he had turned into a stag! But his voice had changed into the call of a stag. Soon he realised that he had reached close to where he had left his friends and the hunting dogs had heard his call. His friends had started chasing the stag and the dogs were after him, unaware that it was none other than their leader and friend. Actaeon had now suddenly become the object of the sport that he was leading till a few hours back. Soon, the dogs caught up with him and tore him to pieces without anybody even realising what had happened and why. As I mentioned earlier, this is a disturbing myth. 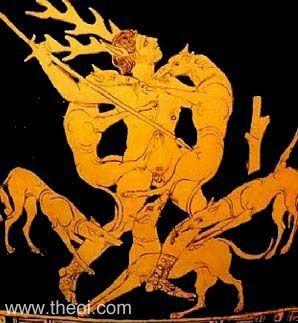 Was Actaeon to be blamed for what he saw, unintentionally? Nowhere are his thoughts on what he saw mentioned. Did Diana act in haste? Let us understand the myth slightly better and understand the lesson it tried to impart, to the Greeks then. This myth can be interpreted in different ways. This can be seen as the malevolent powers of the feminine power, especially of the one who is the embodiment of chastity. It tells man, that the beauty of a female has the power to trap and sometimes lead to ultimate destruction. Such beauty can make the hunter the hunted, even before the hunter realises it. It also serves as a lesson to the wayward not to take the feminine spirit as benign and for granted. According to Greek mythology, stags were associated with spiritual qualities and were supposed to the favourites of the goddess Diana. Here Actaeon being changed into a stag seems ironic, especially when the very form leads to its destruction by dogs. However, the dogs represent the unconscious lust that is hiding deep inside every man’s secret thoughts, and such thoughts have not spared even those who have sought spiritualism. In Hindu mythology, we see a similar malevolent aspect in goddess Kali. Even in her devastating form, she is referred to as Mother. She spares none, who have evil in their heart and actions. The all pervasive benevolent Mother changes into a malevolent form in no time and rests only on drinking the blood of the evil. On this Valentine’s Day, what better way to celebrate than read a love story? 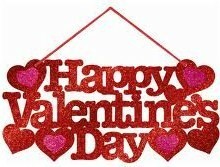 Love is in the air and mythology is replete with stories of love, passion and sometimes separation. This is a Greek love story of Ceyx and Alcyone. Ceyx was the son of the morning star and the King of Trachis, a Greek city. He was happily married to Alcyone, the daughter of the King of winds. Once, Ceyx decided to travel across the seas to consult with the Oracles of Delphi. Hearing this, Alcyone was worried, as she was witness to many a tragic scenes of tempest from her father’s castle. She requested Ceyx not to make the journey, and if had to, then she would accompany him. Ceyx would agree to neither and decided to go ahead with the journey, leaving his wife sad and lonely. No sooner had the ship gone past Alcyone’s sight, it was caught in turbulent weather and all in the ship were drowned. Ceyx died with the single thought in his mind that he had managed to save the life of Alcyone by not letting her accompany him. Unaware of the tragedy, Alcyone would wait for her love and prayed to goddess Juno for the safety of Ceyx. Juno was moved by her plight and sent her messenger to the house of Somnus1, the god of sleep. 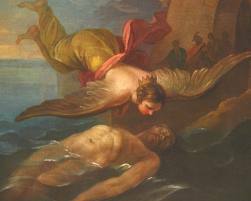 Juno wanted the god of sleep to appear in the dreams of Alcyone and inform her of the death of Ceyx. Somnus commanded his son, Morpheus2, the god of dreams, to do the needful. Morpheus, who could change into any form he desired, took the form of Ceyx and appeared at the bedside of Alcyone, and recounted the gloomy details of his shipwreck and death. Alcyone woke up in tears and called out for Ceyx. Next morning, she went to the seashore and stood all alone in silence. At a distance she could see something floating towards her. As it came close, she realized it was the dead body of Ceyx. She rushed towards the body and before she could drown in the waters, she developed wings and started to fly! 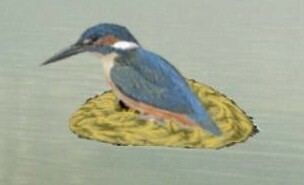 She had been changed into a kingfisher bird (halcyon). 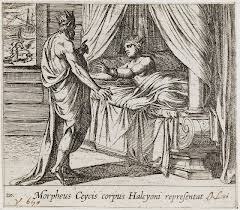 When Alcyone, tried to kiss the face of the dead Ceyx, she could not do so due to the horny beak. The gods took pity on her and soon Ceyx too was converted into a similar bird and both flew away together in the horizon. No wonder they say that the bonds of true love can never be broken and even gods are moved by the plight of broken hearts! It is said that every winter, for a period of two weeks, Alcyone’s father calms the winds and the waves, so that Alcyone in the form of Halcyon or the Kingfisher bird can safely make her nest on the beach and lay her eggs. Hence the phrase in English – “halcyon days” meaning a period of peace and tranquility, owes its origin to this beautiful love story! The ancient people of the Mediterranean used to believe that Kingfishers built floating nests made up of fish bones on the sea. Wherever the nest drifted, the sea would turn calm, thanks to the King of Winds. 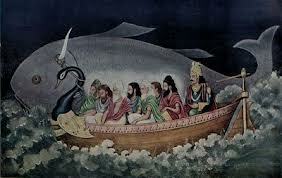 Mariners in the earlier days used to carry a dried body of a kingfisher to ward off the evils of lightening. This myth has been quoted in literature by Shakespeare and poets like Milton and Keats recounting the saga of love in different forms. The recent ban and subsequent confessions by the world-renowned cyclist Lance Armstrong, has shocked the world and more so, his fans. 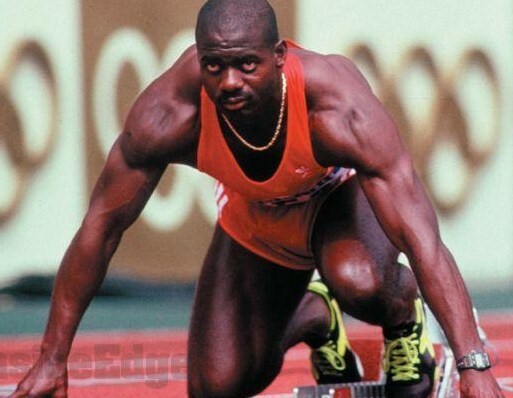 How could someone who people looked up to confess to all the charges of doping? A hero for millions, confessing on international TV, that he had cheated came as a crashing blow to many who had idolised him. Some time back, the same happened with the likes of Rajat Gupta, Tiger Woods and Ben Johnson, to name just a few heroes who came crashing down the pedestal they had been occupying. Mythology is replete with such heroes who occasionally have displayed a fault in their personality. Be it Yudhishtir’s weakness for gambling and Bhima’s craving for food, from the epic Mahabharata. The grandsire of all, Bhishma too was criticised for his vow to serve the throne, which made him commit some grave mistakes. Or be it Lakshman renowned for his anger, a significant weakness in his character, from the epic Ramayan. Had it not been for pride and arrogance, then Ravan would be of heroic traits, instead of the certified villain in the epic Ramayan. Hercules, a Greek hero, known for his heroic acts (and thus the phrase – ‘herculean tasks’), was prone to bouts of anger, during which he would forget what he did. It was during one such bout, that he ended up killing his wife and children. 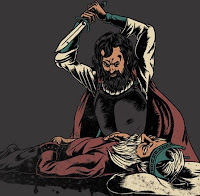 Literature has given us one such hero in Shakespeare’s Macbeth, who had all the qualities of heroism, but the same, came with an ambition which went far beyond morality. 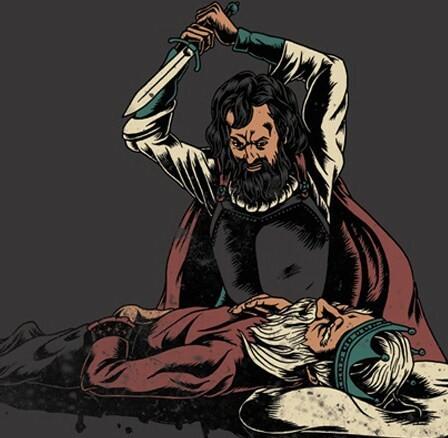 His ambition, adequately fuelled by his wife Lady Macbeth, makes him commit the crime of murder one after the other, all leading to his ultimate tragic end. But Armstrong, Gupta, Woods and others are heroes of modern times. They are not characters from mythology or literature, but ordinary folks like you and me. When Armstrong won his battle with cancer and then went on to win seven consecutive Tour de France victories, then it sure was something beyond human capability, or so it seemed. 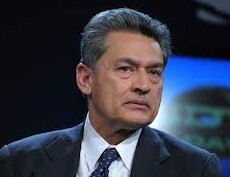 Rajat Gupta career was every middle-class Indian’s dream. From a brilliant academic to the first Indian MD at McKinsey & Co., to a well-known philanthropist, he had it all, till his conviction on charges of insider trading, a crime that cost him a successful career and a jail term. 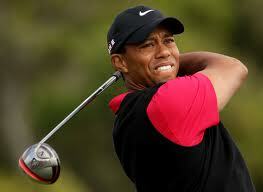 Tiger Woods, a golf legend too had it all, victories, endorsements, a fairy-tale life, till all came crumbling down when his wife accused him of infidelity and later divorced him for the same. Just what is it that goes in the making of such heroes and why is it so hard on their fans than them? Yes, they cheated, but they cheated in a sport or to their spouses or organisation, not you and me. But, we still feel cheated. Why are we disappointed when a hero fails either in an achievement or in character? Are these heroes really ‘god’ as we refer to them sometimes? Who has given them the demigod status? Did they ask for it or is it a big crime that they got swayed in the huge public adulation? Someone has very pertinently asked – “What is the worst thing about Armstrong’s alleged drug use: that he won unfairly, or that he spoiled the glamorous story we constructed about his triumph over cancer and subsequent victories?” I say pertinent, because it is we who make them heroes first and then expect them to live up to our glamorous construct. In them we see the ability to perform those feats that we as individuals can’t even dream of or couldn’t achieve, failed to be precise. They are the heroes who are just short of a new god that we see in the not-so-distant horizon. In their failure, we see a failed image that was nurtured for so long. The fans are hurt and disappointed. When the hero is caught cheating, our faith in him is hurt and it is hard on us to destroy the image, and when we destroy, we do it with far more vengeance than was expected. We are in the 21st century and there are no demigods anymore. Mythology and Literature is not reality, but should only be a point of reference, if at all. Reality is that all those guys who act, perform, play, sing, write or work are mere mortals, slightly better than you and me. Look up to them, but don’t worship them. Follow their paths for the better of it, but don’t worship the ground they tread. The moral of the story is – Make no gods out of mortals and thou shall not be hurt! Tomorrow is Mauni Amavasya, the most important day of bathing at the Kumbh Mela. According to official sources, more than three crore devotees are expected to take a dip at the sangam tomorrow, an administrative nightmare, for sure. The day is also referred to as Maghi Amavasya, as it falls during the magh month of the Hindu calendar. Mauni refers to silence and Amavasya, refers to the first day of the new moon. Legend has it that this was the day, when the primordial couple, Manu and his wife Shatarupa (one with hundred beautiful forms), appeared on earth. Many refer Manu as Maharaja, or the great king while some refer him as rishi, or the sage. Manu is akin to Adam of Christianity. This is the same Manu, who was warned by Lord Vishnu of an impending flood, during the Matsaya avatar (This is Utkarsh Speaking: Vishnu's Dashavatar & Charles Darwin ...) and thus he is also referred to as the Hindu Noah, since god had chosen Manu to be saved along with the sapta-rishi, or the seven sages. According to the epic Mahabharata, Manu was endowed with great wisdom. He was entrusted with the task of being the progenitor of the human race and his offspring are thus referred to as manus (mankind i.e. those who have manas, the ability to think). He is also supposed to have authored the Manav Dharma Shastra, or the Laws of Manu, better referred as Manu-smriti, a treatise which lays down the religious and social norms. The later Brahmins also ascribe the varna-pratha or the caste-system to Manu (This is Utkarsh Speaking: Caste System). However, some later day scholars have doubted this theory, questioning the logic of the progenitor prescribing one of his offspring to be inferior to others. The most significant aspect of the day is the vow of silence, or maun-vrat. Silence has a special significance in all religions, be it Hinduism, Jainism, Christianity or Buddhism. Silence enables one to communicate with one’s own self. The external silence leads to an inner silence, a critical aspect of self-awareness or swadhyay. In modern times, modes of communication are a many, leading to non-stop talking. Man doesn’t get time to think and reflect. Silence creates this room for the much needed introspection and creates an awareness of one’s own thoughts. While we all know, that Silence is Golden, not many of us practice it. This day, enables one to reflect and introspect and seek the individual who is lost in a noisy world. On a personal front, I have never kept silent, except when I am asleep or when I am left alone! While many around me would cherish the thought of a silent me, at least for a few hours, I might just try to maintain silence this time, on Mauni Amavasya, for want of an occasion to keep quiet! If nothing, it might enable my near ones to reflect on their own thoughts for a change! Just to remind you, once again, tomorrow is Mauni Amavasya and may I add, it is also a Sunday! Looking forward to a quieter world tomorrow! !